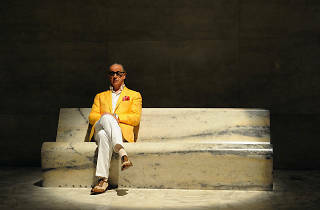 Paolo Sorrentino. Italy, France, 2013. Original language, Spanish subtitles. 142'. Through his unforgettable creation of the seductive character of Jep Gambardella, an experienced journalist, Toni Servillo guides us through a frivolous, decadent Rome populated by a range of empty high-society types. Sorrentino is working under the clear influence of Fellin, specifically 'La Dolce Vita', and, according to the signs of the times, he gives us a postmodern aesthetic loaded with a powerful emotional and critical content. The film received, among other awards, an Oscar, a Golden Globe and the award for Best European Film of the Year. (Read the Time Out review.) Before the film you can enjoy live jazz from Llorens Eva & Manu Moreno (8.45pm).